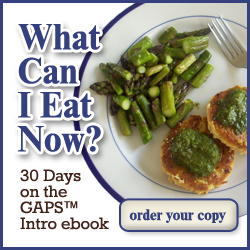 You don’t have to be on the GAPS diet to participate, but recipes that you post should be GAPS Legal. Many SCD, Paleo, Primal, and grain-free real food recipes will fit the bill! I’ve got a cheat sheet below the featured posts if you’re still not sure. This week’s I’m featuring The Great Yogurt Experiment from Patty of Loving Our Guts. She is making yogurt in a selection of different jars, in order to figure out if the jar you use really makes a difference in how your yogurt tastes! See how week 1 of Patty’s experiment turned out! See how week 1 of Patty’s yogurt experiment came out! If your recipe includes other ingredients which can be subbed with GAPS legal ingredients, please make a note of that in your recipe. If you’re unsure about a recipe, go ahead and email me at joy@kitchenlib.com and ask! I’m more than glad to check it out and suggest modifications if needed. Don’t feel like you have to limit yourself to recipes, though! We also love to see book reviews, cooking tips and strategies, recovery and/or setback stories, etc. Anything you think will help other folks on the GAPS diet is welcome, even if it’s not a glowing review! By participating, you agree that I may use an image from your post if I decide to featured your post. Thanks for participating! Please share on facebook, twitter, or wherever else you like! Remember, the “name” field is for is the name of your post, not your name! This week, I wanted to share a fun infographic on some of the things that make us real foodies. You might be a real foodie if…the milk you drink is illegal in 20 states. Come check out the 12 things that may tell you if you’re a real foodie. I hope you get a giggle out of it too! Loved it! Having a sense of humor is what keeps us sane in this world of food-like substances! Thanks for hosting! I am posting from the first time from my new site “Cultured Palate” and am sharing two items. First, I shared a Video on How to Make Yogurt which is so easy without a yogurt maker. Second, I shared Pumpkin Preparation. Thanks for stopping by, Dina-Marie! Congrats on the new site; it looks great.